Well, it’s been nothing but bad news bears around here lately. (That lucky bamboo that I received for my birthday hasn’t kicked in yet… ) Hubs was in a car wreck this morning and thankfully he is okay (albeit bruised and sore), but unfortunately the car didn’t fare so well. He has been wanting a new one lately however, so perhaps something good will come out of it all. I will hopefully get back in the groove of blogging very soon, I ordered some new books from Amazon this weekend and I am SO EXCITED…plus I have an Outlander craft idea. Yep, you read that right, an Outlander craft idea. Intrigued? I hope I can find some time this weekend to work on it. Speaking of Outlander inspired art, I discovered this lovely website, The Author’s Attic, some time ago and have been meaning to post about it ever since. It’s jewelry and charms inspired by the works of some of my favorite authors: Diana Gabaldon, Jane Austen, Anya Seton, and Charlotte Bronte. I haven’t ordered anything, but I love the concept and it seems reasonably priced. You’ll want to check it out if you’re an Outlander fangirl. I’m partial to Brianna’s Bracelet. 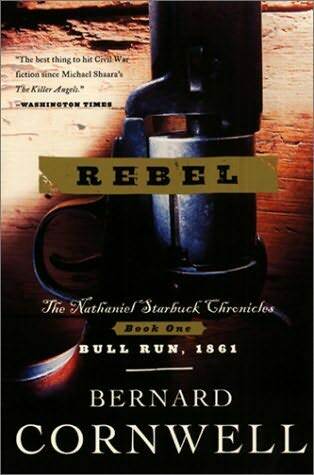 Rebel is the first book in Bernard Cornwell’s “Starbuck Chronicles,” and introduces us to Nathaniel Starbuck, a Yale seminary school drop-out from Boston who finds himself stranded in Richmond, VA the day after the attack on Fort Sumter in 1861. Tensions between the North and South are very high, and Starbuck, with his Boston accent, is detained in the street by an angry mob and accused of being a Northern spy. It doesn’t help that he also happens to be the son of the infamous Northern abolitionist, Reverand Elial Starbuck – a man who is vehemently detested in the South. In a stroke of good fortune, Nate is rescued from the tar and feathers by Washington Faulconer, a wealthy Virginian and father to Adam Faulconer, Nate’s best friend from Yale. Faulconer goads Starbuck into admitting the embarrassing circumstances which brought him to Richmond, i.e., that he fell in love at first sight with an actress, Mademoiselle Dominique Demarest of New Orleans, who was performing in a travelling show called “The Only True and Authorized Stage Version of Uncle Tom’s Cabin, Complete with Real Bloodhounds.” She persuaded him to drop out of Yale and travel with the troupe, eventually asking him to commit theft and run away with her to Richmond…at which point she immediately dropped him for her true partner in crime (who was waiting to take the money). Washington Faulconer is self-absorbed, obsessed with becoming a famous General, and very preoccupied with the oncoming war (and how he can use it to his advantage); but he takes pity on Nate, and since he is a friend of his beloved son, welcomes him into his home and offers him a position in the newly formed Faulconer Legion. Starbuck has never seen himself as a soldier, and to fight with the Confederacy means that he would be fighting against his family and friends; but his distaste for his father’s radical behavior, and the fact that he now sees himself as a rebel (in the literal sense of the word), as well as the desire to please Faulconer and thank him for the gesture of good will, cause him to step up to the challenge. The first battle of his life will also be the first major battle in the Civil War: the Battle of Manassas (or Bull Run, if you’re a Yankee). I really enjoyed this book. It’s historically accurate with regards to the military details and the battle scenes are very descriptive and amazingly vivid. Cornwell brings to life so many of the historical names that are associated with the Civil War: Beauregard, Johnston, and Stonewall Jackson to name a few. The accuracy of the novel appeals strongly to me, but perhaps more appealing is the rich diversity of characters throughout the book. There’s Thaddeus Bird (also known as “Pecker” because of his jerky bird-like movements), who is the village schoolmaster (and hater of all children) and brother- in-law to Mr. Faulconer, who finds himself appointed a Major in the Legion because his sister wished it; Thomas Truslow is a hard-scrabble mountain man who does not want to get involved in the fight, but chooses to volunteer after he is taken aback by his instant likening to Starbuck; Sally Truslow is Thomas’s illiterate, uncouth, vixen of a daughter who uses her feminine wiles to get her way; and Ethan Ridley, the young rake who plans to marry Washington Faulconer’s daughter as a means to gain access to the family bank account. I love the character of Starbuck – he’s an underdog, and I’m a real sucker for underdogs. He’s innocent and naive and truly torn between his oppressive religious upbringing and the newly discovered desires to experience women and war. He does a lot of dithering, but I found it to be very endearing, and I love his penchant for falling head over heels in love. He eventually finds his footing, although I think he will truly blossom as the series progresses.